« An American Family Cooks is on the Stands! Think I can get her cooking in a few months —– I can try! Congratulations – I can’t believe that you are a great-gramma — and what a pretty name. 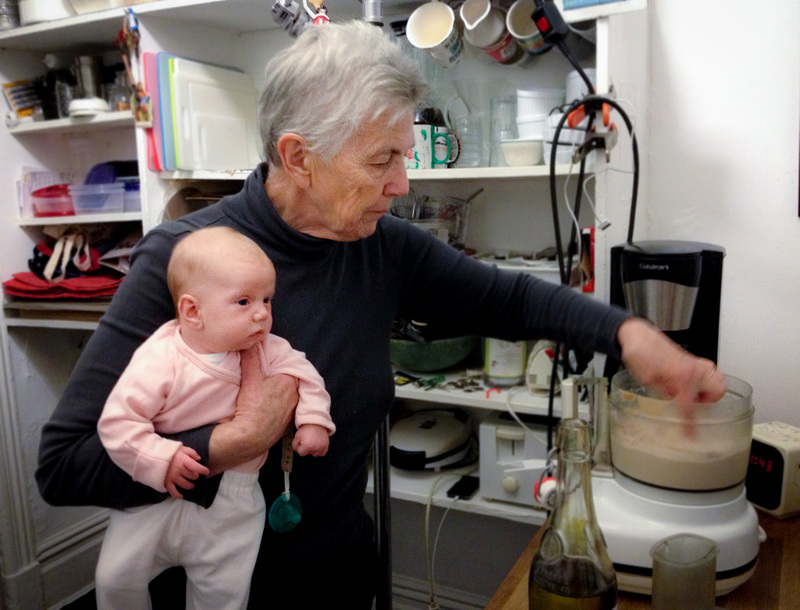 I hope I’ll be around to see that happen for us…..
Are you teaching Willa how to make the gold standard hummus? How’d ya guess!!! It was for the friends and family An American Family Cooks party at our local hang-out, JOE, The Art of Coffee. I can guarantee that you were missed….people still ask about your non-appearance. OK…where is the recipe for Gold Standard Hummus? It’s in our new book, An American Family Cooks – or if you poke around this blog it might be here someplace! Finished browsing and reading your book yesterday and then saw the photo of you and Willa Elizabeth – she has a lot to look forward to – congratulations Judie and family cooks, photographer Steve, artist Stephen… a delicious family valentine. Hope you get many happy hours in the kitchen and at the table with An American Family Cooks – we all have fun and hope our readers will also.